Customers can buy from us a wide and qualitative range of Printed Blister Pack, which is a widely used packaging material in the pharmaceutical industry. 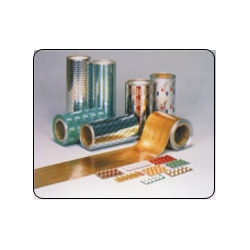 These packs are fabricated in compliance with the prescribed industry standards using cutting edge technology. Further, our quality controllers stringently inspect the products on various parameters of quality to ensure that these are defect-free. Our range of blister packs are available in compact sizes and are economically priced. Looking for Blister Pack ?